The Silent Hunter...: Gut Reactions Review: I got yo back homie! Random incoherent ramblings of some dude on the internet, with an infatuation for video games. pfft, yeah, like THATS original. Gut Reactions Review: I got yo back homie! 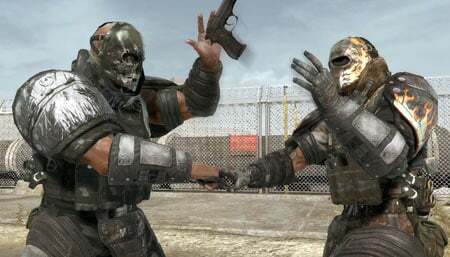 So after work i ran directly into FutureShop and picke dme up a copy of Army of Two for the PS3. Why not 360? I think my 360 is on the verge of bricking, and i need an online game for my PS3. So why not? plus 360 apparently has no local coop, and the PS3 does. = Win. The game delivers on pretty much all fronts that i expected. The gameplay is alot more frantic and fun than i expected even from the videos. The graphics are absolutely top notch the whole way through, a couple blemishes but meh, i can forgive the occasional muddy lowrez texture. Especially when the framerate stays at 60fps and never drops. you press triangle to vault over a fence arm, and your to push in the left stick to duck and walk under a fence. becuase im on a 480i TV i can barely ready anything text wise in the game so i was guessing my controls the whole way. i didn't duck but i did hold L2 to precise aim, and this apparently led me to complete the sequence as now i am zapped to the next segment, standing on a platform i should have reached on my own. Some things are jsut dwonright confusing, the training level had me stuck, i tried for a good hour to get past the area where your supposed to sneak around the armoured guy and take him out from behin. He was no problem, getting past that fence was another issue all its own. it wasn't until i redid the whole thign and got stuck again, did i realize i was supposed to do some of the onscreen instructions in order to continue doing anything. Excuuuuuuse me. Cut me some slack. but once you get in the game, and get to customizing your weapons and armour, and the ability to pick your personality (i chose Salem, as he closely resembles me as much as this game could haha), the game REALLY begins to shine. please though, do play this with a buddy. While the Ai controlled partner is sufficient, and actually adapts to your play style (if you constantly rush hell just eventually start staying behind on his own, vice versa, and many more), they do dumb mistakes that make you REALLY wish you had a partner sitting beside you or across the globe watching your back. i really need to buy a second controller, when is that damn Dualshock3 coming out. Its a great game to play with buddy, on your own its pretty borish truth be told. Loners and misanthropes, watch out, as this title may not be for you. Ramblins: The Return of Vlogs and a new Feature! Ramblings: Back in business baby! Ramblings: Could something else go wrong please? Ramblings: Deciding Factor: Smash Bros Brawl!